Springtime in Grand Teton NP is an exciting time. Bison, Moose and Elk have dropped their young. Birds are nesting and beavers and river otters tend to their young. 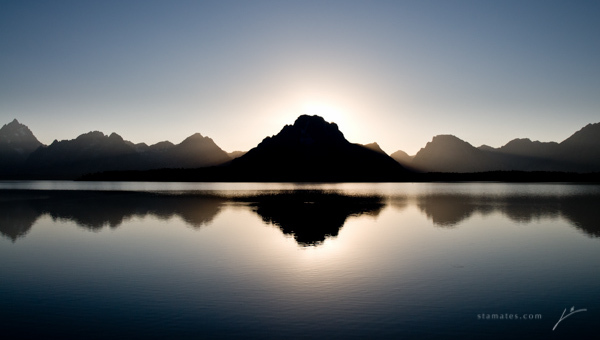 We arrive before dawn at Schwabacher Landing and we wait for the sun to kiss the tops of the snowcapped Grand Tetons. The reflection in the beaver pond adds the perfect touch to our first image of the day. Then on to Mormon Row to get the classic shot of the barns with snowcapped peaks in the background. Bison herds move in unison as the brand new calves jump, play and chase each other. That’s just the first morning and we have many opportunities awaiting us. We head to Oxbow Bend but not for scenics, instead we look for grizzly bears chasing elk calves to feed their young, (5 spring cubs in 2010). We also look for beaver, moose, and elk along with their newborn calves and pups. Don’t forget to look up! Bald eagle and osprey nests cap the tall snags. Pronghorn, coyote, and fox fill the memory cards and this is only the first day! Join Jim and Kathy Stamates for 4 wild days to learn, shoot, and experience Grand Teton National Park in the spring. This is an intense 4 days of photography. We will position ourselves each day before dawn for the best light and best wildlife or landscape options. Each day ends with our cards filled with exceptional images. We eat lunch as a group at one of the local in-park restaurants with time to socialize and get to know fellow enthusiasts. Instruction will be in the field. No strenuous hiking.